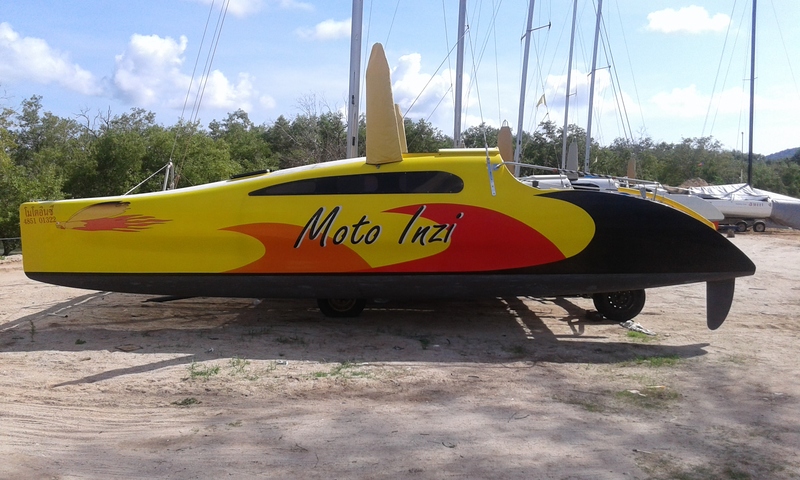 Since then, Moto Inzi has been an integral part of the Thailand Firefly 850 One design fleet. 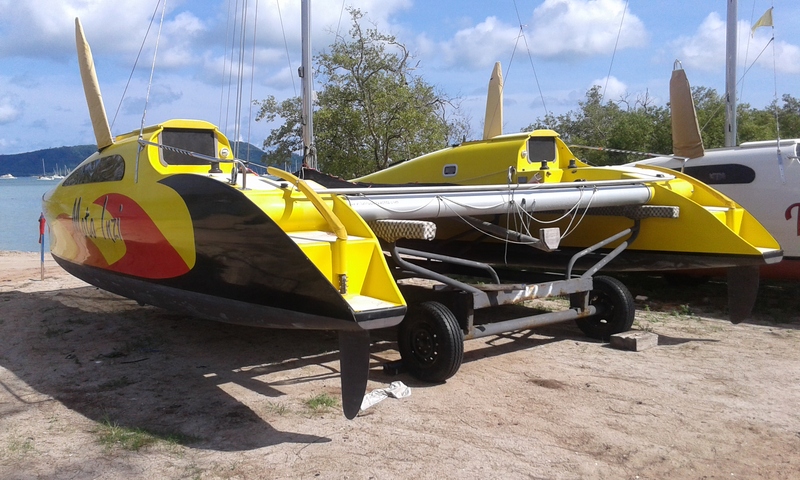 Meticulously maintained by owner Roger Kingdon, who has also been the class secretary, Moto Inzi has competed in every regatta in the region, at times dominating the Firefly 850 OD fleet. 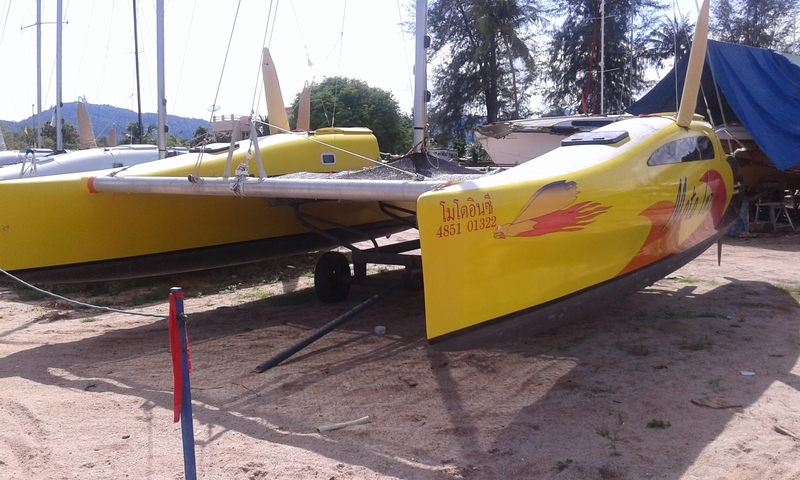 Roger also disassembled Moto Inzi to take her to the Top of the Gulf Regatta in 2006 and the Samui Regatta in 2006 and 2007. The 200 mile passage from Pattaya to Koh Samui, into the squally southwest monsoon proved the seaworthiness of the Fireflys. 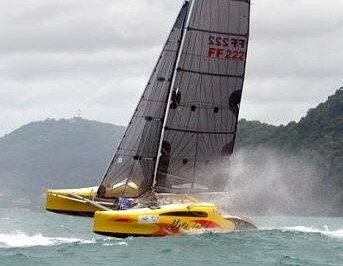 His crew member for the overnight passage who had done ‘The Race’ on one of the maxi catamarans described it as his ‘worst night at sea, ever’.The constant 30 knot plus squall certainly made conditions tough. Racing main and jib, by Rob Meizer, less the 2 years old. Quantum spinnaker, one year old. Pryde 90 and Pryde 80 spinnakers, 2 years old. As well as the racing sails there are a mylar taffeta mainsail and a darcon mainsail. Old racing GM jib, taffeta jib, dacron jib and small class jib. Small Tasker spinnaker, original Tasker spinnaker and old Pryde spinnaker. All the rigging wires have been recently renewed ,the main shrouds and forestay, June 2013 and the diamonds wires in September 2014. Outboard motor is the original well maintained Suzuki 6hp four stroke. Haulout trailer, 2.7met Aquapro RIB and 3hp Mercury outboard are also included. Moto Inzi is complete with all necessary class equipment including handheld GPS and VHF and is ready to race. Due to failing health, and a relocation away from Phuket, Roger is now offering Moto Inzi for sale at a reduced price of 1,400,000B.